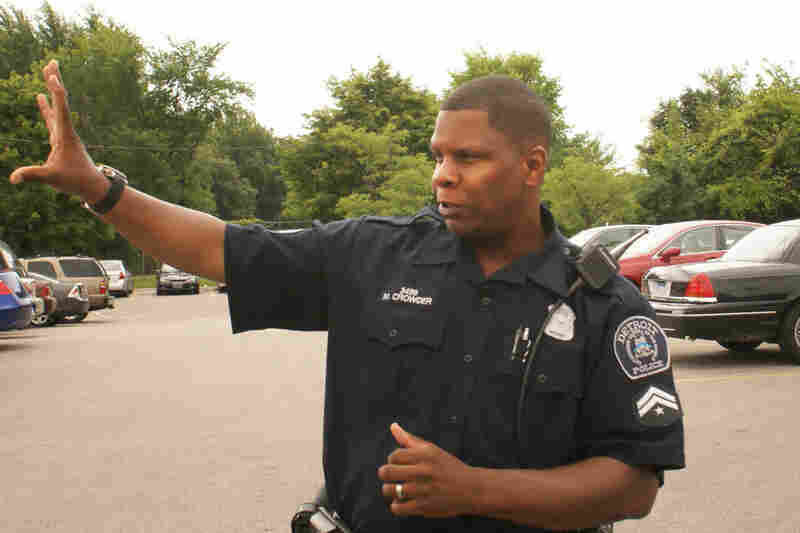 Other Cities Poach Police From Detroit's Low-Wage Force From Toledo to Houston, cities are courting Detroit cops, who are seen as battle-tested from routinely dealing with high crime rates — and fed up from years of low pay and cuts in benefits. Officer Michael Crowder says his roots are too deep to leave Detroit, but he knows younger officers who were lured away by better pay. In a Detroit police squad car, Officer Michael Crowder cruises through one of the city's more well-to-do neighborhoods. Crowder says he loves his current assignment — concentrating on a specific neighborhood community. But he notes that these are tough economic times in Detroit, and that's effecting everyone here — including the police. "We've had food drives where the community comes up to the precinct," he says. "They'll give us baskets of food. Two, three years now, we've had officers depend on Goodfellow packages." For years, police in the city of Detroit have dealt with low wages, a lack of new equipment and one of the nation's highest crime rates. Now, as the city moves through bankruptcy, there's talk of eventually raising police officers' pay. But police departments outside of the city are increasingly trying to recruit Detroit's finest to come work for them instead. Crowder has more than 16 years on the force, and his ties here are too deep to let him think of leaving Detroit. But he says for other, younger officers who are contemplating a future in a city struggling to climb out of bankruptcy, loyalty takes a back seat to finding higher wages. "I have a couple friends that have left, that have gone to different cities to work, because of the pay, the benefits. ... A lot of our officers are working secondary employment, believe it or not," Crowder says. Detroit police saw their paychecks cut by 10 percent two years ago. Now the police union is negotiating a new contract with the city, whose bankruptcy exit strategy calls for increasing the size of the force by more than 12 percent over the next decade. The force lost roughly 400 rank-and-file officers in the past half-dozen years because of budget cuts, attrition and early retirement. The officers who remain are valuable, battle-tested professionals, says Mark Diaz, head of the Detroit Police Officers Association. "The city of Detroit police department has become a training ground for other municipalities, other law enforcement entities, because of the level of crime that our officers actually handle," Diaz says. From Texas to Toledo, police recruiters are noticing, and trying to entice Detroit's officers to move. At a job fair in the Detroit suburb of Pontiac, Officer Mark Slade touts the benefits of a career with the Houston Police Department. "We're not here to steal officers away," he says. "We just want to let the Detroit police officers know that there are other viable opportunities available." Slade notes that senior rank-and-file officers in Houston can earn nearly $74,000 a year. In Detroit, patrol officers currently top out at about $47,000 a year, only a little more than the starting salary of cadets in Houston. "It's almost a slap in the face," says Slade. "They have a tough job. You know, the city of Detroit is undergoing a lot of change, and they've been forced to do a lot more with just a little, and I just want to support them any way I can." That's not quite what Detroit police command officials want to hear. In the year since Chief James Craig took over the department, Detroit police have decreased response times and reduced the city's homicide rate. But Craig has also complained loudly about other cities poaching Detroit's finest. With officers considering employment elsewhere, companies investing in Detroit's comeback routinely supply their own security force. Some Detroit business owners say they have to take matters into their own hands. At a Gulf gas station on Eight Mile — Detroit's city limit — owner Kaid alg Ahmi says more police stop by his store now than before Craig took over. But Ahmi says drug dealers still often gather outside his door, and that means owners like him sometimes have to confront them directly. "You have to kind of take your store back," he says. "Because if you see it, and they know you're watching it, and you still allow them to do it, that's it. They'll run amok. They'll bring in more friends. 'Hey, you guys, look how much I made at the Gulf gas station.' ... That's when it's over."